Home / Theatre / Who’s Afraid of Virginia Woolf? 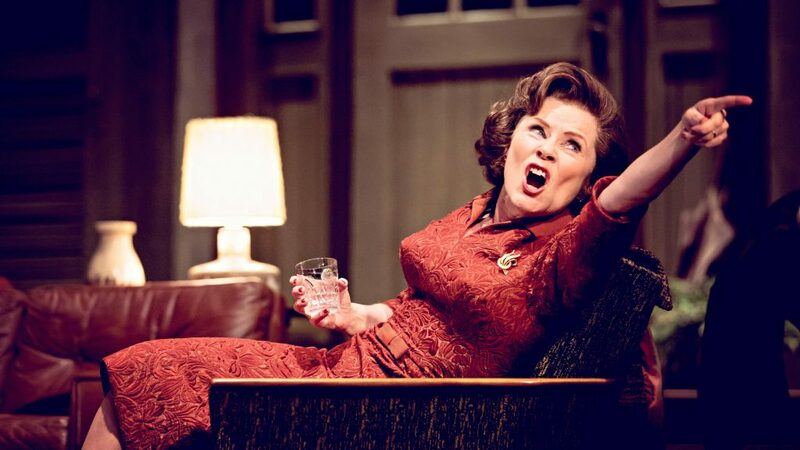 Last time the Edward Albee show Who’s afraid of Virginia Woolf was in London it was at the Shaftesbury Avenue with Kathleen Turner as the booze-fueled, husband hating Martha. It sounds like perfect casting to me, but I never got to see it. 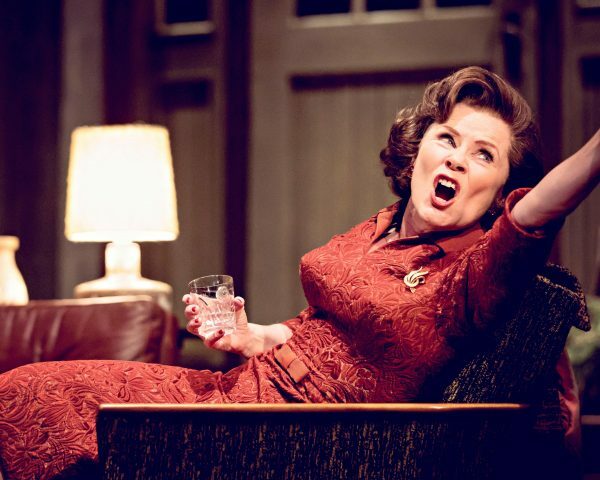 This year the show is on at The Harold Pinter Theatre with the glorious Imelda Stanton and I had to book a ticket! Conleth Hill (Game of thrones) is Martha’s husband George, who is emasculated by her infidelity and constant reminders that he’s a big fat failure. Yet for all its acidity, there’s a real tenderness to their wonderful onstage chemistry, and underneath the disturbing, toxic games they play there’s love! Why else would they stay in a marriage for so long? George is an associate professor at a New England college and Martha is the daughter of the college president, they arrive back from daddy’s party having already been over-served and Martha has invited a young married couple back for more over-serving. The house guests are biologist Nick (Luke Treadaway) new to the college and his wife Honey (Imogen Poots). They are offered copious amounts of bourbon, brandy and front row seats to witness the carnage ahead. However, undaunted by the presence of guests, and aided by voluminous quantities of alcohol, George and Martha continue their verbal assaults on each other. ‘You make me puke’, says Martha to George. ‘If you existed, I’d divorce you’, she adds. In retaliation, George is equally sarcastic and vitriolic – he imagines her ‘buried up to her neck in cement’ and calls her a ‘monster’. It’s breathtakingly shocking stuff, but we, the audience, find it hard not to laugh as the blistering attacks continue, increasing in their intensity, ferocity and bitterness, eventually escalating into a physical attack when George launches himself on Martha’s throat, thankfully to be saved by the athletic Nick. But the guests also come within the line of fire as the hosts play a series of ‘games’ during the course of the play. In ‘get the guests’, for example, George is brutally cruel and venomous in relating the reasons for Nick and Honey’s marriage. And Martha is equally merciless in revealing Nick’s alcohol-induced ‘floppiness’ after another game: ‘hump the hostess’. There’s more dirty laundry aired than you can imagine and the way Martha treats George was at times uncomfortable to watch. 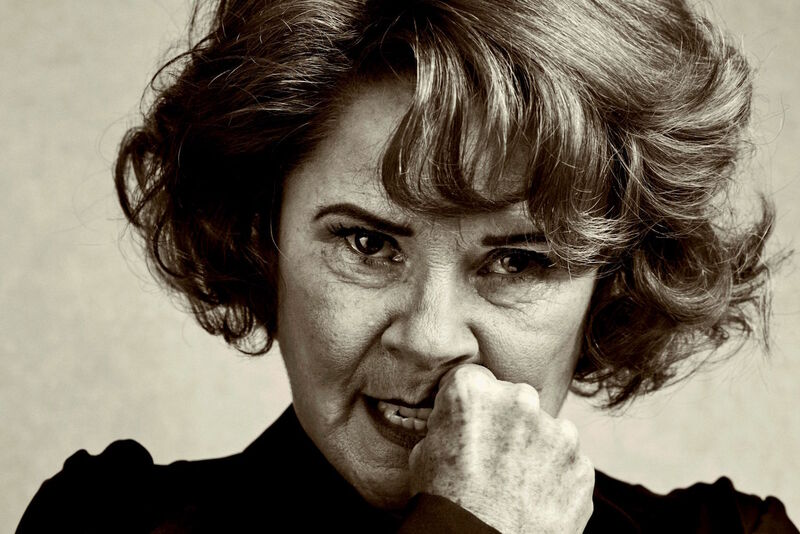 Her belittling and bullying, over and over, made me want to jump on stage and stand up for the poor guy. But which of the stories they abuse each other with are true? James Macdonald‘s often crepuscular production came in at a hefty 3 hours. Despite the punishing length and as grisly as it sounds, much of it is biting and bitterly funny. Staunton progresses to become more hilarious, wretched and pitiable by turn. Hill is brilliant, more than a match, even his height and frame against Stauton’s diminutive stature adds to the incongruity of their relationship. Poots and Treadaway (star of The curious incident of the dog in the night-time) are terrific as the drunken spectators and Poots captivating during a dance scene. Who’s afraid of Virginia Woolf perfectly illustrates the difference between the questions “Was it good?” and “Did you enjoy it?” This is a fantastic play, and a wonderful production of it. It is quite exhausting to watch, I can only imagine how challenging it would be to act! Tickets are avalaible at the theatre or online.